I have always fallen into a vicious cycle where my exercise and weight loss are concerned. During the summer months I get out to the nearby track and walk or jog for miles as my heart loves the heat from the sun, and so do my joints. For me, the hotter the better. I would get in those really good workouts 5-6 times per week and go into the fall months feeling really great, but then winter would hit. I am not a girl who likes winter (well, not the one in Maine anyway) and I barely want to go from my front door to the warm car during those long months, let alone go for a walk or a jog in freezing temperatures while trying to maneuver around piles of snow and patches of ice. As the winter months continued to keep me inside I would go into panic mode knowing that all of my progress made during the summer months would be lost and my momentum stalled. I’m not a huge fan of fitness DVD’s, so I never stuck with any as a part of a good exercise routine during the winter months. I’m a very no-nonsense person and I hate excuses, so that last statement makes me feel a bit hypocritical because if my health, fitness, and weight loss were always a priority then I would have found a way to work out, regardless of the temperature outside. Last year, at about this time, I expressed my fears to Paul about not being able to exercise and I brought up the idea of investing in a treadmill. Now we live in a very small space, so this creates a huge challenge especially when considering adding a fairly large piece of fitness machinery to our household. It’s perfect as far as convenience to the kids’ school and our downtown, especially since we are a one car family, but yeah, a bit on the cozy side. I was certain of one thing when we were discussing the prospect of a treadmill purchase. I needed for it to be in our living room and I needed it to face the television. I realize that a lot of people would probably consider it very tacky to put a treadmill in a living room, but I’ll take tacky and fit over proper and unhealthy any day. Paul agreed and we picked out a reasonable priced treadmill, made space for it in our living room, and fought over who would get to pound their feet on it first. That treadmill got me through the next few months of chilly weather until I could get out into the hot sunshine and soak up an overdose of Vitamin D while working on my fitness at the local track. It got me through the rainy summer days or the days that I just wasn’t able to get to the track for one reason or another. It especially got me through last fall and has been my best friend this winter. I truly cannot tell you how pleased I am to have made this decision. Since I don’t believe in excuses, I’ve literally set myself up to have zero excuses because that treadmill sits prominently in our living room, facing the television, and always available to me regardless of the weather outside. It has kept me on track toward my weight loss goals while also keeping me sane during these very long, cold winter months in the Northeast. Awesome?? Your are hilarious, but thank you! 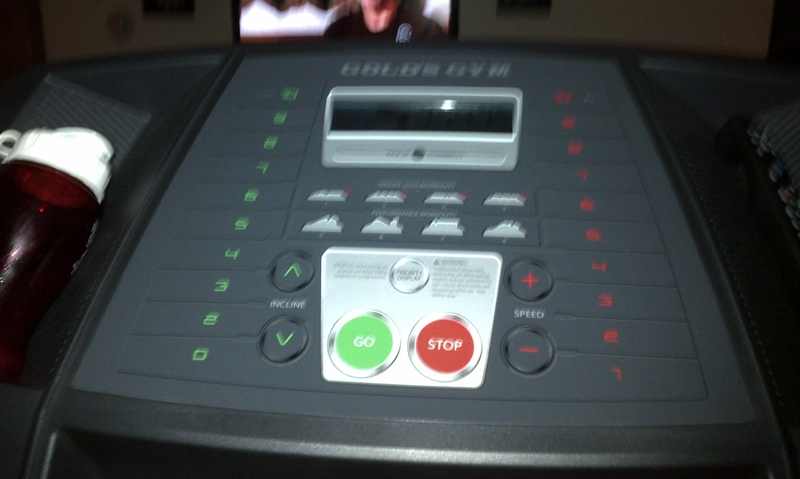 My favorite machine is actually the elliptical, but this treadmill has been a true gift, especially since it faces the t.v.